On the morning of May 10, 2018 local time, Premier Li Keqiang met with Japanese representatives who had participated in the process of signing the China-Japan Treaty of Peace and Friendship and their relatives at the hotel where he stayed in Tokyo. Li Keqiang expressed that 40 years ago, the elder generations of leaders of both countries made strategic resolve with great foresight and signed the China-Japan Treaty of Peace and Friendship. The Treaty confirmed various principles of the China-Japan Joint Statement in legal form, elevated it to the will of law that must be strictly abided by as well as confirmed the general direction of ever-lasting friendship and peaceful coexistence between China and Japan. Today, 40 years later, the two sides should continue to adhere to the guidance of the Treaty, show greater resolve and make greater efforts to increase mutual trust, build consensus and properly handle contradictions and differences so as to jointly promote bilateral relations back to normal track and for new development. 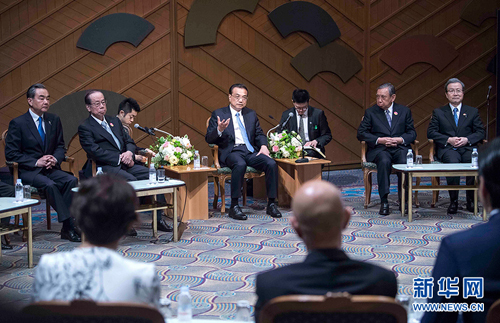 Li Keqiang pointed out that the journey of the development of bilateral relations in recent years has proved that only by adhering to the principles and spirit of the four political documents between China and Japan including the China-Japan Treaty of Peace and Friendship can the relations between the two countries achieve stable development. Otherwise, there will be twists and turns. Both sides should cherish the current hard-won momentum of improvement in bilateral relations, carry forward the spirit of the Treaty, and push bilateral relations for new progress, in a bid to showcase stable and positive expectations to the two peoples as well as the international community. It is hoped that you will continuously care for and support China-Japan friendship to make new contributions to steady and long-term development of bilateral relations from a new starting point. More than 20 Japanese representatives attended the meeting, including former Prime Minister Yasuo Fukuda, former Speaker of the House of Representatives Yohei Kono, former Foreign Minister Sunao Sonoda's son Hiroyuki Sonoda, former Prime Minister Yasuhiro Nakasone's son Hirofumi Nakasone and former officials of the Foreign Ministry who had participated in the process of signing the China-Japan Treaty of Peace and Friendship. They briefly reviewed the history of the signing of the Japan-China Treaty of Peace and Friendship as well as expressed full agreement with Premier Li Keqiang's remarks. They are fully confident in the improvement of bilateral relations and believe that bilateral relations will constantly maintain healthy and stable development. The Japanese side is willing to take the 40th anniversary of the signing of the Treaty as an opportunity to cooperate with the Chinese side, so as to promote Japan-China friendly cooperation for new and greater development. Wang Yi and He Lifeng attended the above activity.